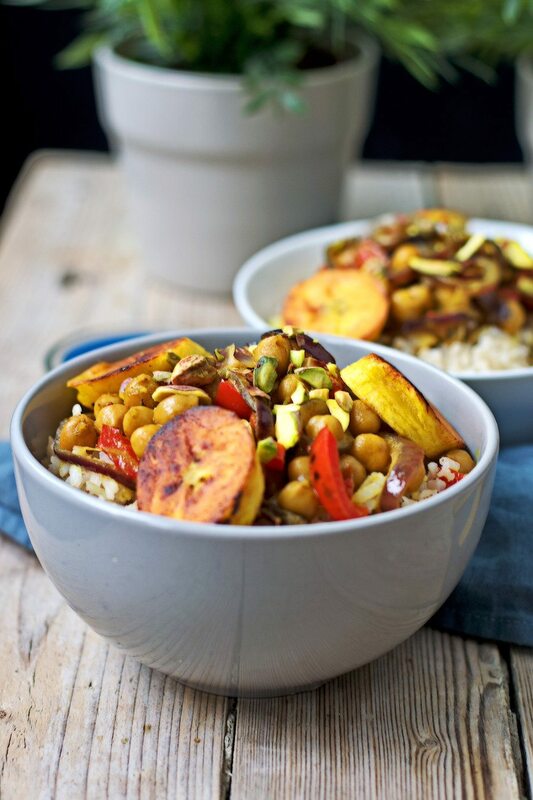 My new Vegetable Curry with Plantains is a wonderful vegan recipe that is bursting with flavor. 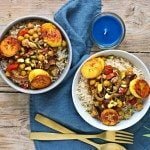 Healthy ingredients, amazing spice, and plantains that are crunchy on the outside and soft on the inside make this dish a winner in all regards. Trust me, you will love it. I bet you guys have already had several curry recipes coming your way. But I bet none quite like my Vegetable Curry with Plantains. I think this is so amazing, made from only a few ingredients, that it could easily become your favorite vegan curry recipe. On my list of ingredients with which I’d like to cook some time is reasonably long and I hope I’ll be able to work through that list eventually. One item on the list are plantains. Or have been, I should rather say with this recipe. Plantains seemed to be hard to get where I was living before so imagine my excitement when I was recently strolling through the store and saw these unusually big bananas (what I thought it was). Only slowly I realized that it was plantains and excitedly put some of them in my basket. That discovery came at absolutely the right time. I have a new friend who is a big fan of curries and knowing that I have this blog, she challenged me to surprise her with something different because she was getting somewhat bored with the ones she had had so far. A vegan vegetable curry. Even though I was honestly a bit skeptical I surely said “Yes, I can and will!”. So I came up with the idea of giving you my take on a Vegetable Curry. One that is easy, with few ingredients, suitable to prepare in advance. The list of ingredients is small, as always on Contentedness Cooking. You need a bit of coconut milk, chickpeas, onions, a bell pepper. Some spices. And of course the plantains. First you sauté the chopped bell pepper and onions, before you add the coconut milk, chickpeas, and the spices. Then you briefly fry slices of the plantains. That’s all. It is amazing how fast this dish is to make and how much of a timesaver it is. 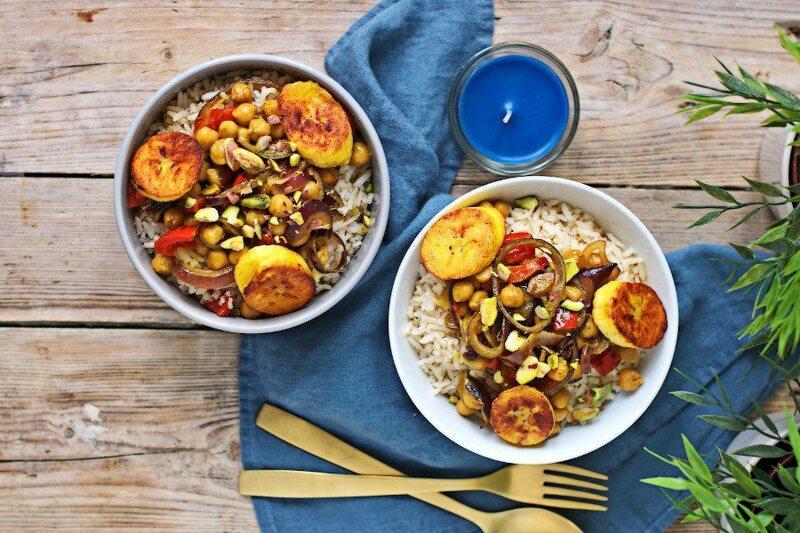 No surprises, or hidden secrets just straightforward – my Vegetable Curry with Plantains is an easy recipe as always. In the end, this curry recipe was a big hit. My friends and I simply love it. It is full of healthy nutrients from the plantains, veggies, and it contains good fats from the coconut milk. You should give this Vegetable Curry with Plantains a try to find out what it means to have a new favorite curry recipe. If you try my Vegetable Curry with Plantains, I hope you will snap a picture and let me know on Facebook, Pinterest, or Instagram. I love to see everything you do. Cheers, Florian. Seed the bell pepper, peel the onions. Chop both into coarse bits. Heat 1 Tbs coconut oil in a sauce pan. Add the bell pepper and inions and sauté for about 5 minutes. Add coconut milk, chickpeas, curry, and turmeric. Bring to a boil, then reduce heat and let simmer for 10-15 minutes. Season with salt and pepper. Peel the plantains and cut into slices. Heat 1 Tbs coconut oil in a frying pan and add the plantain slices. Fry on medium for about 3 minutes on each side. 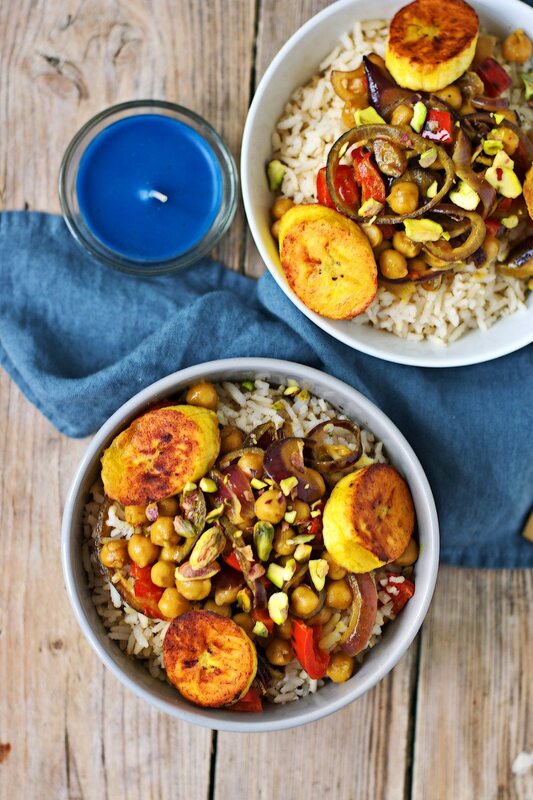 Serve the curry topped with the plantain slices and, optionally, with rice and pistachios. Great pics! I love plantains but I don’t buy them nearly enough! Plantains! Omg yes! Such a great addition to the curry! This looks amazing Florian! I love curry flavors and rice of course is a weekly staple in my home. I love how simple it is! I love the beautiful colors and pictures. I bet your friend just loved this! I have never tried fried plantains before, I bet that adds such a nice element to this wonderful dish. Love how easy and fast it comes together too! Great recipe! What a great and colorful fall dish! I love the pop of color. Looks so delicious! This is a beautiful dish, Florian. I love curry and especially love the addition of plantains. I need to give this a try soon! Awesome, Joanie! Let me know who it worked! This is such a fun and vibrant dish Florian. How lucky that you finally stumbled upon plantains as they definitely add something special to this curry.